A little intimidated at the idea of flying to Africa? Here are tips to find cheap flights to Kenya. They are there, if you know how and where to look. This page gives you many tips. Just like any bargain shopping, you will get the best results if you take the time to look around for cheap flights to Kenya. Few markets have such in-transparent and fast-changing price structures as the travel market, so it pays off to map all your options and get as many quotes as possible. I have two favorite search sites for finding cheap flights to Kenya. Kayak.com searches 140+ travel sites for the lowest prices in seconds. This means you don't have to go to all these sites yourself. They have a lot of Kenya flights. Vayama.com is especially good if you're traveling to or from the US or Western Europe. Vayama searches over 100 airline sites and, on average, finds more flights than any other flight search engine. Both offer a lot of flights to Kenya. Sometimes, it pays off to split your flight to Kenya into more flights. Especially if there are a lot of cheap tickets available on a part of your route. This works especially well for travelers from North America and Australia, as there are no direct flights from the USA, Canada or Australia to Kenya. Americans and Canadians have to change flights at a European airport – often London, Amsterdam or Brussels. Alternatively, this can be done in the Middle East or even Southern Africa. 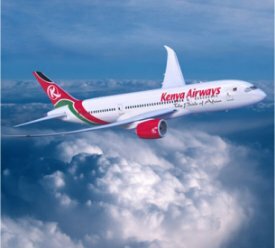 But London or Amsterdam may be cheaper because of the UK’s historic ties with Kenya and the KLM’s joint venture with Kenya Airways, respectively. Australians have to get their connecting flight in southern Africa, the Middle East or Asia. Check out my page with available air connections to Kenya from various continents. One way to find cheap flights to Kenya, is booking outside the tourist seasons. (This also goes for e.g. hotels, resorts and rentals.) The tourist high season is from December-January and July-August (coinciding with the European summer holidays). The main disadvantage is that off-seasons are also largely rainy seasons – here’s more about Kenyan weather and tourism. If you cannot fly outside tourist seasons, there are still a number of small and less obvious changes that you might be able to make to your timetable that can help reduce your costs. If you have more than one flight to choose from, pick one that leaves extra early (or very late) or with a weekday departure (except Fridays). These flights are less popular and usually have a lower price tag. Do include a weekend in your itinerary, because otherwise airlines will assume you’re a business traveler and the price accordingly goes up. Travel agents buy flights in bulk, and can get them cheaper. Sometimes they also charter an airplane themselves. That’s why it may be advantageous to book a package or tour with accommodation included. You’re not obliged to stay there, so you can book other accommodation or use the first one as a base for trips. Sometimes, the whole package is even cheaper than one return ticket bought from an airline. You can sometimes even include car hire in one package. Some of these packaged trips fly to Mombasa, not to Nairobi. You can get a connecting flight in Mombasa or take the cheap night train or, still much cheaper, the bus to Nairobi there. However, as both some popular national parks and the beaches are close to Mombasa, it’s even better for many tourists not to fly to Nairobi at all. If you travel with Flying Blue airlines, you can accumulate award points. This way you can earn discounts on tickets, free upgrades and other travel rewards. Free flights are even better than cheap flights to Kenya! It’s good to know what airports in Kenya you have to choose from. The largest international airport is Kenyatta International Airport, just outside of Nairobi. This is where most large airlines will operate out of, and Nairobi does make a handy hub due to its central location, modern amenities and mild weather. There are other international airports in Kenya that might suit your vacation needs. 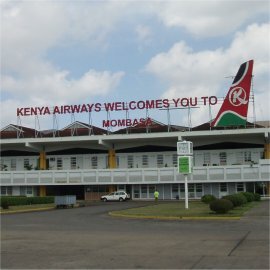 Moi International Airport is located in Mombasa, right at the coast. If you are heading to one of the coast towns or resorts (i.e. Diani or Tiwi beach, Malindi or Lamu island), then flying directly to Mombasa may be convenient. If your destinations are farther west, like Mount Elgon, then look for flights coming into the Eldoret Airport, near the Tanzanian border. Other airports include Wilson Airport, also located in Nairobi. It is mainly used for cargo transport and flying to popular destinations. Then there's Kisumu International Airport, located in western Kenya. It can be used as a direct link to the rest of the world. So with a little time and research, finding cheap flights to Kenya is not impossible.